Some people love Valentine’s Day, some people think it’s a cheesy holiday and some people are indifferent and don’t really care at all. Whatever your opinion, it might be nice to think of it as a special day for spreading kindness. Yes, we should all be kind everyday, but it’s nice to dedicate a day especially for being kind. My blog post last year on Valentine’s Day was a Valentine’s Day Kindness Challenge. So again, this year, I challenge you to take a few moments out of your day to do something kind for someone that needs it. You might also want to show yourself a little love! While trying to find interesting Valentine’s Day inspiration for this post, I ran across the picture below and did a little research to find out more about it. It’s a flower installation by Lewis Miller who has made it his mission to brighten the day of his fellow citizens’ daily commute. Keep scrolling to read a little more about this amazing idea! It seems to me to be the ultimate Valentine’s Day gift…spreading beauty and making people smile! “If you live in New York City—or lurk on social media even a little bit—chances are you’ve come across the following strange and wondrous sight: A huge, colorful arrangement of fresh flowers placed at a seemingly random location. Perhaps a larger-than-life bouquet of forsythia and sunflowers bursting from an empty city trash can. Or a mammoth garland of roses draped around a statue in Central Park. These installations are so striking, they’ve likely caused you to stop in your tracks. They’ve also likely caused you to ponder the identity of the genius bandit behind these glorious acts. Sadly, Necco, one of the oldest candy companies in the United States closed it’s doors recently. 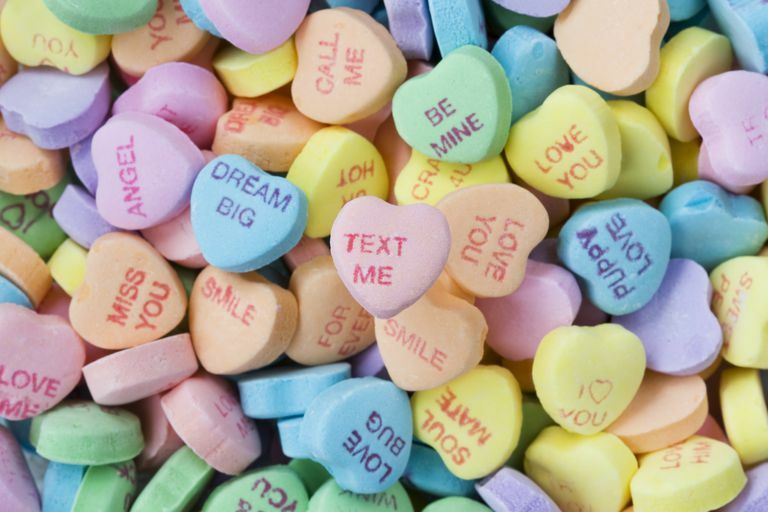 Candy hearts have a long history, and so does Necco. The sugary disks that were first manufactured during the 1800s could travel so well that they were shipped to American troops overseas during World War II. Sweethearts appeared around the turn of the 20th century, and in the decades since, Wafers and Sweethearts (which were made from similar, but not identical, ingredients) have earned reputations as quintessential American candies. Before the factory closed, Necco was producing billions of Sweethearts every year. Scroll through this gallery for some great gift ideas for Valentine’s Day and don’t miss my Valentine’s Day Gift Guides! Put your most fashionable foot forward in these Cupid approved Valentine’s Day Outfits! Whether you’re going out for a special dinner, or just watching a movie at home, it’s fun do dress up for the occasion. This casual but so cute sweater from Tory Burch doesn’t have to be worn only on Valentine’s Day and the other pieces will take you right into Spring! Create a sweet masterpiece for your Valentine…or yourself! This Strawberry Cookies and Cream Cake from Joy The Baker is easy and delicious, and…maybe the perfect Valentine’s Day Dessert! Thanks so much for reading today! Have a great weekend!